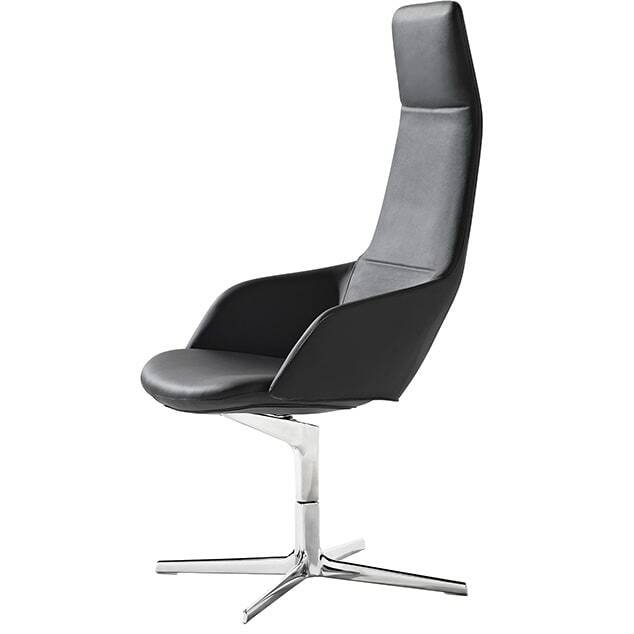 Elegant direction chair Aston 1922 with extra high backrest. Sleek, light, dynamic lines for Aston, that comes in a range of fabric or leather coverings to match any decorating style. The lounge chair designed for contract use, also fits perfectly into the domestic habitat, with its matching Aston Ottoman footrest. The central swivel structure comes in polished or painted aluminum. The Direction, Office and Conference models complete the collection and they are distinguished by the height of the chair-back. The three models come with a choice of two bases: a 4-star base with optional automatic seat positioning mechanism or 5-star base with castors and a gas-operated height adjustment mechanism. The versions of the Aston collection, with their distinctive design and balanced proportions, are intended for conference halls, offices and executive meeting rooms. aston 1922 without seat repositioning mechanism is also available as aston 1925 and aston 1928 with lower back rest. Do you have a question about "Aston 1922"? How can we contact you?